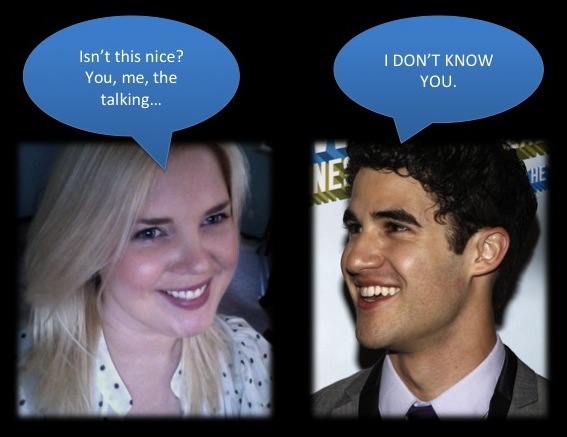 So, I maybe had a little too much to drink the other night, and started having an imaginary conversation with Second Husband, Darren Criss (of “Glee” fame). This is that conversation. Honestly, I’m surprised this doesn’t happen more often. GO JULES GO: I love you so much. I don’t even care if that makes you uncomfortable. GO JULES GO: It’s funny you say that. When I was about to molest First Husband, he had a similar reaction. GO JULES GO: Yes! Exactly like that. I was all, “Do you think I’m pretty?” and he was all, “Um…” and I was like, “How would you feel if I did something stupid right now?” and he was like, “Um…” and then I attacked him. GO JULES GO: Well, you know. Kissed. Geesh. Didn’t you read my guest post for Laughter is Catching? SECOND HUSBAND: Guest…post? Is that like when you fill in for someone on security duty? GO JULES GO: Ha ha! There is so much I can teach you, Second Husband! Let us start with the rules of plural marriage. SECOND HUSBAND: I don’t like where this is going. GO JULES GO: Oh, don’t be coy. You know I saved the best for last. SECOND HUSBAND: So you’re stopping at two husbands? How am I supposed to believe that? GO JULES GO: Well, if you’d just grow a handlebar mustache I’d feel a lot better about making this official. SECOND HUSBAND: I would rock the shiz out of a handlebar mustache. GO JULES GO: I know you would. And you just said shiz. GO JULES GO: So I love you. Who are you having imaginary conversations with? Previous postSlap Bracelet Pictures: June 6th Deadline! Oh this was hysterical. 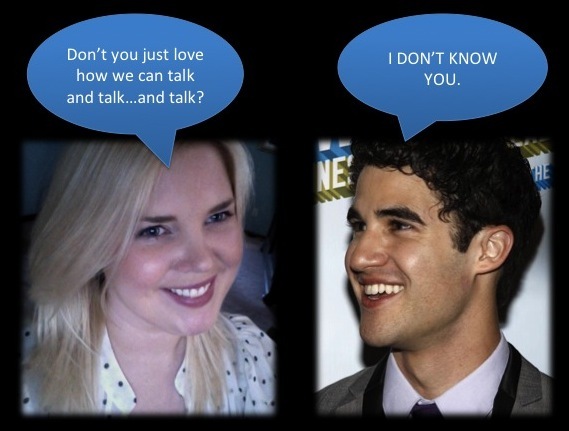 But I have something to tell you, I also have imaginary conversations with Darren Criss. And he knows me. Sorry. Do I have to send in MORE pics of your fabulous bracelets with chipmunks again? What’s going on? I think I missed the memo. *gasp* Darla!! Please tell me these conversations center around your urging Second Husband to consider polygamy [with me]? It’s important to have variety in your man-harem, to be sure. Afterall, not everyone can hang a door or break into song n’ dance in a jiffy. But when it’s a womans harem, it’s called ‘polyandry’. Learned that in 8th grade world history class. note to self: sign up that guy from the Souza Tequilla commercial to be my First Husband! Hey Jules, just stopping by to warn you that Darla may come over and invite you to a sleepover, but tell her that you’re already going to a sleepover at MY house so you can’t come, ok? Did I tell you how sparklingly lovely you look today? Spectra, can we share that tequila guy? Hmm? What did he say? Did you eat bacon? I like bacon. Well. Sometimes but not burnt bacon. Bacon is cool if you mix it with a margarita. Do you like the salt in your margarita? Jules nods. I make a face. Jules shrugs. Take the good with the bad? So you like potato chips? I’m an all-comer when it comes to salt. Well, depends–like potato chips piss me off. Disappointing. Oreos do not disappoint me except when Ben eats the middle part and puts the cookie part back in the container. Um, you know I’m totally going to continue this conversation, right? How do you feel about Oreos in milk? To me, the Oreo on its own is, yes, disappointing, but once paired with milk, or, say, put into pie form, it’s magical. Not as magical as bacon is all the time, but come on, they can’t all be bacon. p.s. If you send me your e-mail address (yes I can dig it up–gah! but I don’t wanna) I will send you an invite to WANA Tribe! Thank you so much again, El! You’re awesome! So much I can learn from you – I cant get mysellf to commit to a first husband. You need to see with the shirt off – sculpture-esque! I have real convos with myself all the time. Bobby, too, but that’s awkward as I have to tranlate FOR him, then give my response. I try to do it in different voice to differentiate but sometimes I forget to switch. You’ve heard Bobby. He’s rather polite but for all the swearing. He can’t help it. Canines don’t really have a swearing policy. He picked it up from the kids at school. Ha! “I don’t know you.” Well, Jules, methinks it might be time to remedy that. Apparently you need to hook up with Darla and get this polygamy party started!! And what if Peppermeister just grew the mustache? Would you be good with just 2 at that point? I would exploit anyone I know to remedy this. Anyone. I don’t know about any imaginary conversations, but I did have a dream about William and Kate last night. I have often fantasized about becoming BFFs with the Duchess of Cambridge after Prince Harry finally meets, falls head over heels in love with me and we celebrate our union with a gaggle of ginger babies, but my dream has me worried. See, I was invited to stay over at Will and Kate’s house (which was delightfully normal and like any other suburban house) and I was blowing it. Though the Duke and Duchess were the perfect hosts, I felt like everything out of my mouth was completely dull and I secretly knew that I was boring them to pieces and they regretted having me over. NOOOOOO!!!!! I woke feeling empty and disappointed, like the life I had imagined had been snatched away from me and I was powerless to stop it. I guess this is what happens when I watch a tv special AND read a biography about Her Majesty the Queen (my future grandmother-in-law) before bed! Jessica, this is truly tragic. I’m not sure I would have been able to get out of bed afterwards. Did you ever watch that Lifetime special, “William & Kate,” that came out around the time of the Royal Wedding? I kept it on the DVR for a YEAR, and watched it 4 (okay, maybe 5) times. It’s so bad, and so good, and I thought someone was going to buy it for me for my birthday so I deleted it from my DVR (Peppermeister was always on my case about it, because it took up a ton of space in high-def, ha! ), but they didn’t, and now I’m pissed. It was a rather horrible way to way up, but somehow I pulled myself together. I’m still quite certain that the ever-cheeky Harry will find me darling! “So you’re stopping at two husbands? How am I supposed to believe that?”—This is an excellent question. Thoughtsy hit the nail on the head. It’s not that we don’t trust you, but what if another uber-cute boy/man comes along and catches your eye? Will you ditch one of the first two title holders? He really gave me pause there, but I hope I didn’t let it show. Rocking the shiz out of a handlebar mustache. Now that is original! Susie, it might be time for a new blog tag line… LOL! Ha! The perfect imaginary conversation in every way, Nancy. I think singing ability is absolutely mandatory when it comes to any potential spouses, whether they be #1 or #100. You’re welcome. He does indeed rock the shiz out of a handlebar mustache, but let’s be honest, he rocks the shiz out of anything. Him: Hey beautiful, thanks. Let’s run away and get married. Me: But… what about Jules? Him:: She can come too! Me: Okay, let’s go! PS- lovin’ that handlebar mustache. Me: Indeed, indeed you are. Then, he would passionately kiss me and pull me up onto the already waiting stallion and we would ride away into the sunset. (After we picked you up of course). Actually, if I ever met him I’d probably burst into tears from how beautiful he was and stutter out some mess or words that may or may not be English. But I’d be in his presence, so life would be good. This post made me laugh, A LOT. This reply made me whole day. I am glad that a mustached-Darren will accompany your wallet, because really, who else could better decorate it? That’s right, no one. And I did see the tweet! Oh how I wish I was in DC tonight! Thank you so much, Valarie! You’re the bomb diggity (and I assume you’ll tell me if the kids aren’t saying things like that anymore). They don’t, but for you, I’ll let it slide. I blame Kurt for not letting Blaine grow out a mustache. Clean-shaven pretty boys are overrated, Kurt! Ah! Yes! You’re so right. Although that ‘stache is more Luigi from Mario Brothers and less ‘I want to lure you into the back of my van,’ which is the look I’m after. P.S. – Actually, he looks like Borat! LOL! OMG, YOU ARE RIGHT. I was trying to figure out who he looks like all of yesterday! I have imaginary conversations with Patrick Stewart as Captain Picard, in which he makes many blush-inducingly lewd allusions to his space ship and taking me to warp nine. Make it so, indeed. Kathy, I am so proud of this I can’t even begin to tell you. You really get it, don’t you? Oh man, I love this. 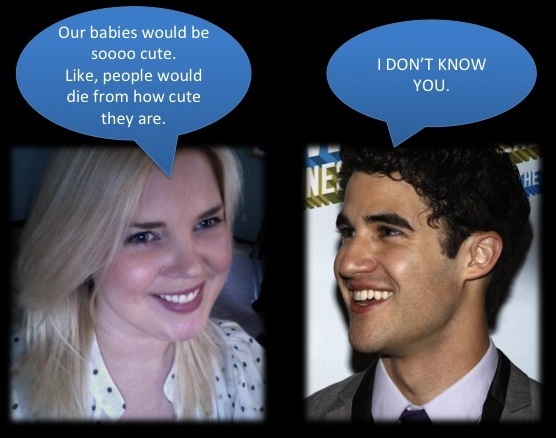 And I love Darren Criss. And I love that you chose a picture of him without hair gel. And I love everything about your blog. And, I would keep going, but this is getting sort of creepy. Soon you’ll be saying crazy things like, “I don’t know you.” Thanks for the laugh, as always. Rian, I always knew you had exquisite taste, from photos to food to bloggers to actors/singers/beautiful future spouses. I have imaginary conversations with our cat. I want the cat to talk, tell me where he’s been and all the gossip from down our street. He must know so much and yet I’ll never know, so I imagine him telling me where he’s been and what he’s done. Well, I mean, that’s only sensible that you fill in the gaps. I’m a little worried about imagining what Uncle Jesse (our dog) would say if he could talk, though, because he’s kind of prissy and I can only assume he’d have something sassy to say about the lack of fabric softener I use on the sheets (which cover the king bed he sleeps in). And thank you so much for all of the Twitter lovin’! I must apologize – I’m trying to get better with Twitter, but I seem to be stuck in WordPress Land! I would love to tell you who I have imaginary conversations with, but I’m so filled with shame I just can’t. More shame than Hoedown Throwdown shame, that’s how much shame. So I’ll just let you use your imagination. …okay. But don’t tell anyone, oba-kaybee? LOL! Your secret’s safe with me. This is a place to embrace ALL fantasies and guilty pleasures. I mean, at least it’s a living male human. AND he’s rich and talented. (Are you feeling better now? ;)) Although, not to insinuate that female would be bad. I’ve said it before and I’ll say it again: I would totally make-out with Mila Kunis. I have a girl crush on Felicia Day. Although I was told the other day that everyone has a girl crush on Felicia Day, so I guess I’m not that unusual. Lol. You mean other than imaginary conversations with my second husband who’s actually my best friend and I hope harbors a secret love for me that I envision him protesting one day and I will be so torn as to what to do like all of the great epic movies? Yeah. Then it would be my celebrity boyfriend, Aaron Paul. Marta! Wait-a-hold-it. Are you serious? This is most intriguing! I’m so ashasmed I had to Google Aaron Paul, but I totally know who that is after seeing his picture! Hottie with a body. I was wondering why Iwasn’t getting updates from your blog and I now realize that I wasn’t even subscribed. I am an awful (yet incredibly amazing and pretty and talented and funny) person. LOL I thought you were already, too! Maybe it’s WordPress’s fault. Yeah! Let’s go with that! The smiling “I don’t know you” picture of Second Husband is the BEST! I laughed every time he said it. He seriously would rock a handlebar mustache. standard. I have imaginary conversations with both Tom Hardy and Ryan Reynolds all the time, and sometimes I have imaginary battles between the two where they compete to win the rightful place of first husband. I do feel bad though because Ryan Reynolds is a bit pretty for fighting, gets a papercut and cries. There there Ryan…. am I still telling you this?? Wait wait wait, I thought Ryan was a tough guy? Or is it because I just watched “Drive”?? HA HA HA Oh my gawd that’s hilarious. For some reason I was convinced you loved Ryan Gosling, too. I don’t think I ‘get’ Ryan Gosling’s appeal. I DEFINITELY get Ryan Reynolds’ appeal! P.S. – This comment went to spam?! BOOOO WordPress! I might have more imaginary conversations than I do real ones. The imaginary ones are definitely more intense and exciting, and end with me being awesome. Ha! Jess! You must put aside anything important you have to do today, open PowerPoint and start inserting pictures of you and George. Then all you need to do is add the conversation bubbles. You can make him say ANYTHING. we are looking to swap techniques with others, please shoot me an e-mail if interested.